I decided to give it a shot Friday night after I got word that my fellow handliner compadre Dave was going to head out. It looked like the rain was going to clear out before dark so I made plans to hit the water around 8. Of course the rain didn’t completely quit but a little sprinkle was no big deal. When I arrived at the ramp I was pleased to see that the water levels were way up. As a matter of fact they were at the highest levels I had seen in years. Not surprising with all the rain we have had. After I launched the boat I pointed her downstream and headed towards the only other boat on the river, Dave’s. I pulled up along side and asked how he and Larry had been doing. No walleye yet but only 1 Silver Bass. Oh Happy Day could they finally be gone? We shall see. I went downstream a bit more and set up behind them. I started to follow them for a bit but once I saw both of them bringing in Silver Bass at the same time I made a right turn and avoided that area. Didn’t matter, I found them as well. Oh well, can’t have everything. It wasn’t too much longer before I felt that old familiar headshake that I have missed so much. A few seconds later and I had my first walleye in the box. I would end up with 3 for the night, 2 on a #11 Clown Rapala and 1 on a Red Wonderbread Nite Stalker Pencil Plug. I ended up catching about 20 Silver Bass. Once it got dark they pretty much shut down. The only problem was the weeds, not the ones on the surface but that stringy moss that seems to hang around the bottom. It seems like I was clearing lines every ten minutes. I’m sure that wasn’t helping my catch rate. I did catch one fish that surprised the hell out of me. I have caught just about everything the River has to offer but not one of these. As a matter of fact after 40 years of fishing the Detroit River this is the first one I have ever caught. 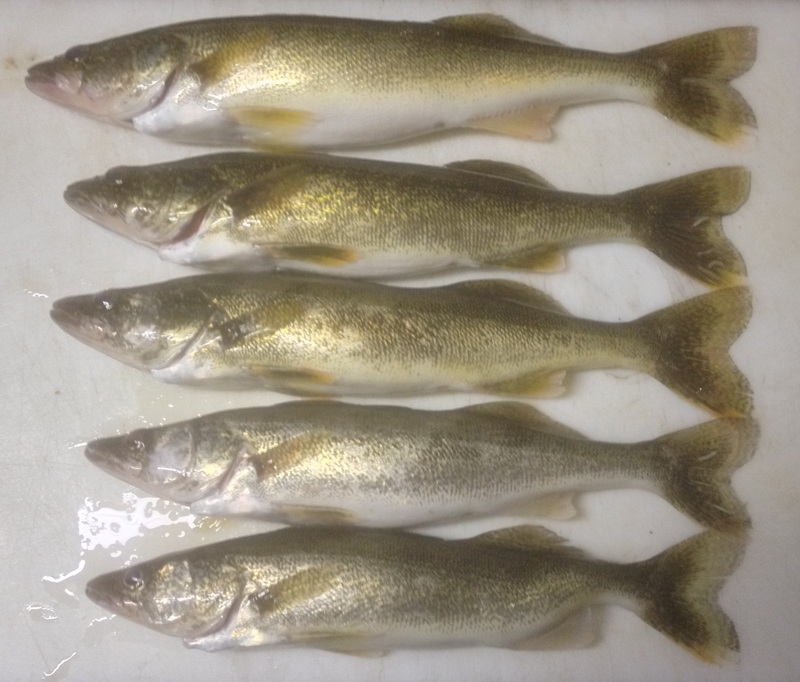 I have picked up a few in the canals around Grosse Isle or Gibraltar out of my Kayak but never in the middle of the river while walleye fishing. When it first hit I wasn’t quite sure what it was. There was to much weight for it to be a Silver Bass but it was fighting too much to be a walleye and not enough to be a Smallmouth Bass. I hoped I wouldn’t lose him because I really wanted to see what it was. I was careful and eventually I got him in, a Largemouth Bass. That was a first and I will probably never repeat it. Largemouth Bass are not known to hang out in the area I caught him in, Smallies yes, Bucketmouth’s no. Around 11:00 pm I finally called it quits. 3 fish wasn’t too bad, I didn’t lose any lures and no damage to the hands. The Silver Bass are definitely thinning out and by next weekend they should all be out in Lake Erie terrorizing the Planer Board Brigade. Conditions weren’t bad. Surface temps were 67 degrees and the water clear. No surface weeds but that moss below was a pain. The NE winds were calm for the most part but they did pick up as the evening progressed. Not a bad night after not getting out for a month. Sunday morning I headed for the river again and hit the water at the crack of 6:20 am. I wanted to start earlier but I overslept a little. The water temps were about the same as Friday and it was still clear. A few surface weeds and a fair number of dead Mayfly’s and casings. It was overcast as well and I hoped it would last. I started running spoons and a #9 Rapala at first and it wasn’t long before I was into the Silver Bass. They were in small schools much like Friday night, 3 or 4 right away and then nothing for about 20 minutes. Problem was the walleye were scarce as well. I didn’t catch my first one until almost 9:00 am. I ended up with 2 and I lost one at the boat as well. 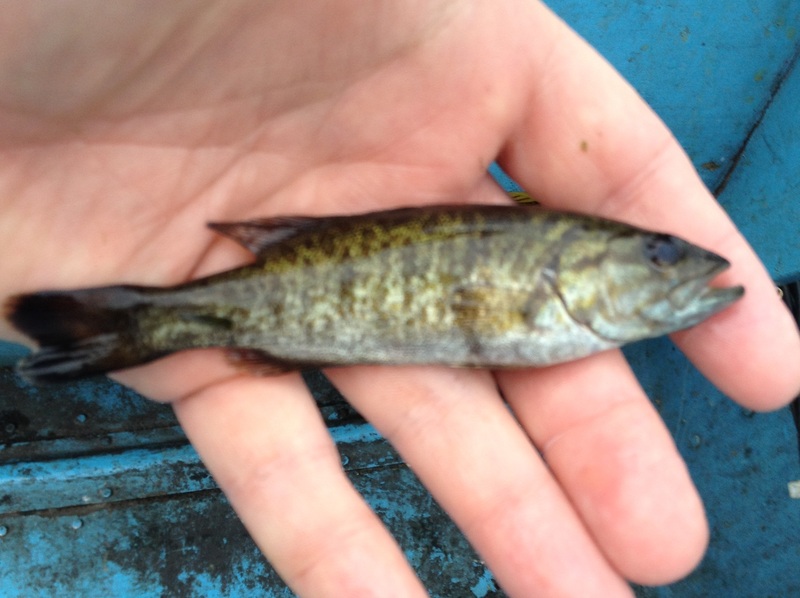 I caught about a half dozen Smallmouth Bass ranging for a minuscule 3 inches to a 20 inch pig. Boy was he a handful. Around 11 I gave up and headed home. I had a long list on yard chores waiting for me and they weren’t going to get done on their own. Conditions weren’t bad at first. Light winds and overcast skies. Water was still clear with about 3 feet of visibility. If it continues to stay that way I am going to stick to evening fishing. I may try over at Amherstburg this weekend in deeper water. Hopefully some of the smaller eaters will move back into the river by then. Once they do it will be Game On II. First Largemouth Bass Ever on the “D”. May is a very fickle month for a die hard river rat. By now the water temps are up in the 45 to 50 degree range and the big girls are out of the river. The males are in feeding mode now and that means easy limits. Problem is that it doesn’t seem to last very long anymore. Back in the 80’s it was a given that the walleye fishing would be fantastic until mid month. It still can be now but we have to deal with something else. 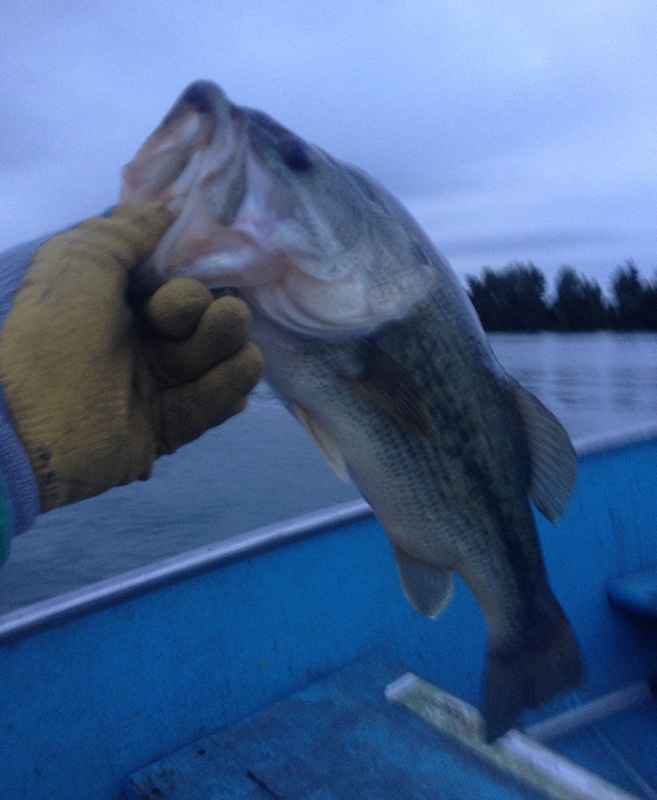 That’s right; my favorite’s…….the White Bass. For the last 5 or 6 years it seems like this run has lasted longer than the previous year and produced more and more fish each time it happens. There has always been a healthy population but now it seems like they completely take over the entire river system. Some people can’t wait for them to show up. I’m not one of them. The DNR could take away the possession limit and it wouldn’t bother me one bit. Like death and taxes though they are a constant annoyance and they have to be dealt with. 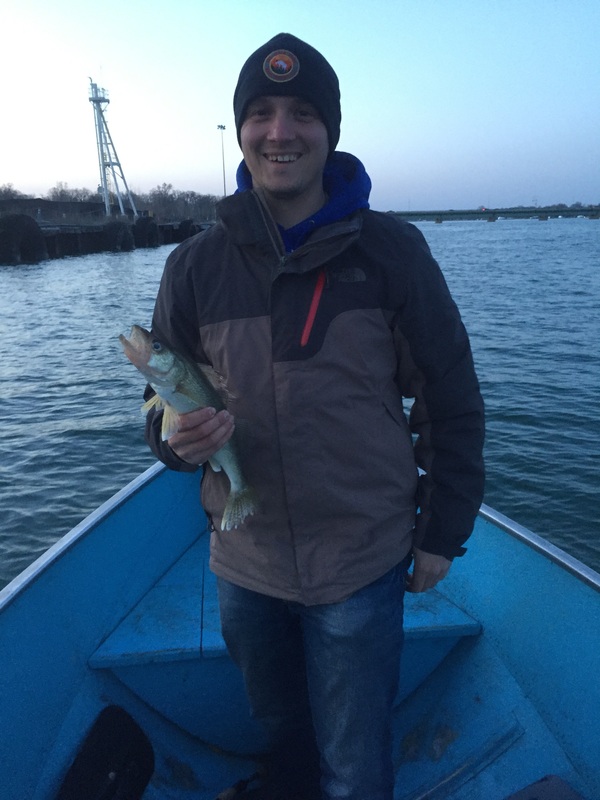 Walleye can be caught though during these trying times, the tactics just have to change. There are a couple of options I have to avoid the White Bass. Though they are not entirely fool proof they can at times drastically reduce my catch and still put walleye in the boat. The first one is to change presentations. This time of year I will jig more than any other. I use a ¾ ounce jig and a Wyandotte Worm and I will jig the channel edges north of the Grosse Isle free bridge. I will still catch White Bass but I will also catch the occasional walleye. It won’t be a lot of them but I can usually manage to put a couple in the cooler until it gets dark. Once it gets dark I put the rod away and head back downstream. Now some may ask why I don’t just stay where I am. Well the reason is that I hate catching White Bass in deep water Handlining, especially 3, 4 or 5 at a time. It’s bad enough in 10 feet of water but 30 feet down gets old in a hurry. Some nights it’s not a problem, usually dark, cloudy no moon periods. Other times though they will feed all night. I never know what they are going to do so I limit my exposure and hassles as much as possible. Besides, I really enjoy fishing that 10 to 15 feet of water in The Channel. Again, there are walleye all up and down the river, it’s just a question of fishing where someone is most comfortable. Once it is well past sunset I will set up in my usual areas and run the same leads with one change. The Rapala’s stay in the box and out come the pencil plugs, or more specifically Nite Stalkers. A Nite Stalker is nothing more than a plastic pencil plug. For years pp’s (pencil plugs) were made by hand and out of wood. Nothing wrong with them and there are plenty of them in handliner tackle boxes. I just like the Nite Stalkers (I wonder how many more shameless plugs I can get it in?) because they are plastic, they have great color patterns and most importantly the eye on the front is forward enough that I can use the same crank bait snaps I use for other body baits and spoons. The old wooden pencil plugs have the eye set so far back in the cup of the head that I can’t get the snap on. I don’t like fighting with lures when I should be fishing so I just stick to the Nite Stalkers (4). Besides, they come in a lot of chrome patterns and I like chrome. Also, Nite Stalkers (5) are made right here locally in Michigan and I’m all for supporting the local businesses. Now on most nights a White Bass won’t bother with a pp, they don’t have a lot of action so they won’t trigger a lot of strikes. There are those nights when it just doesn’t matter, usually during the very peak of the run. There are ways around that as well but I will discuss that later. I will still get a few but no where near the 100 or so I would catch if I was using a Rapala. That’s not an exaggeration either, a handliner could very easily catch 100 or more in an evening during the run when using Rapala’s or spoons. Over the years I have kept track and I average about 2 or 3 white bass for every walleye caught using Nite Stalkers (6) or pp’s. If I was running Rapala’s or Spoons the number would increase 10 fold. Fortunately for me I live so close that if I get one of those nights where they just won’t stop I can always go in and try another day. I feel sorry for those that have to make the long drive. They are pretty much stuck and just have to deal with it. One more thing about Nite Stalkers (7) and I promise I will quit. They have big sharp hooks and a lot of them. 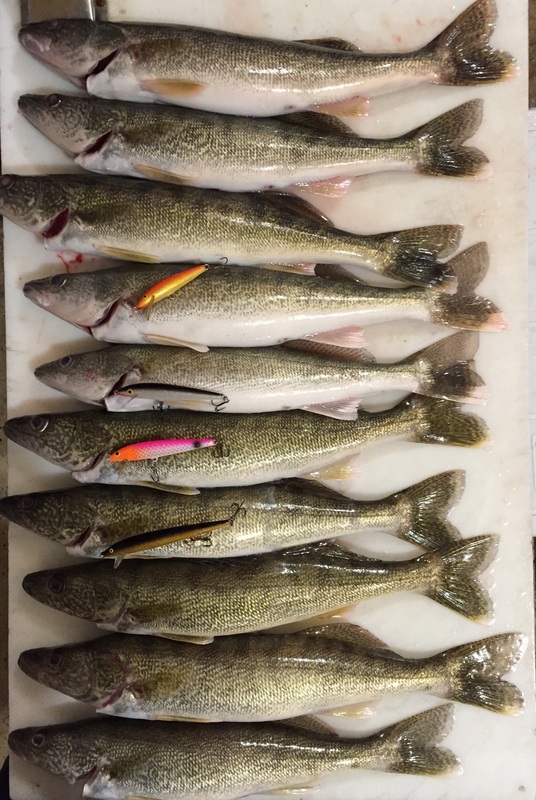 I don’t lose too many walleye when I am using them. They don’t dive as much as a Rapala either so I don’t tend to get hung up as much. 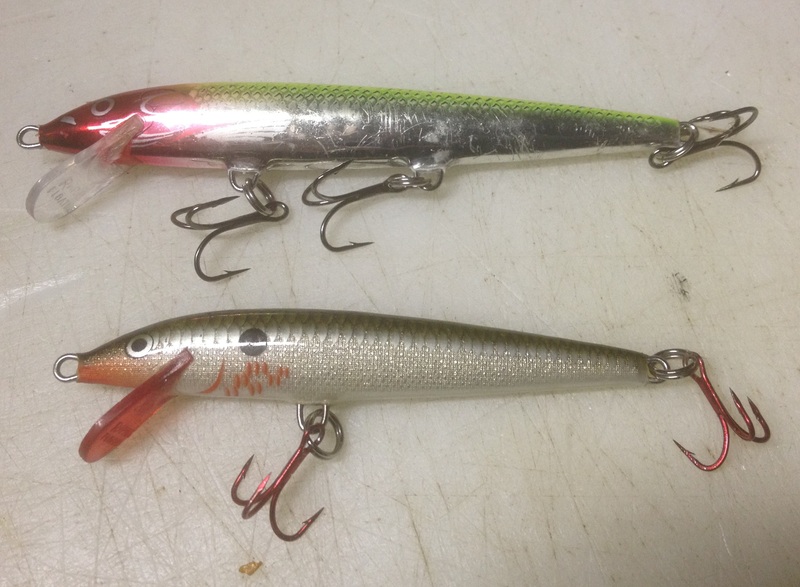 Also, Nite Stalkers (8) are almost half the price of a New Rapala. Now one of my other tactic changes is that I fish a lot later at night. The run coincides with each passing day getting longer so I have to start later. Because of this most of my fishing is reserved for Friday and Saturday night since I don’t have to work the next day. 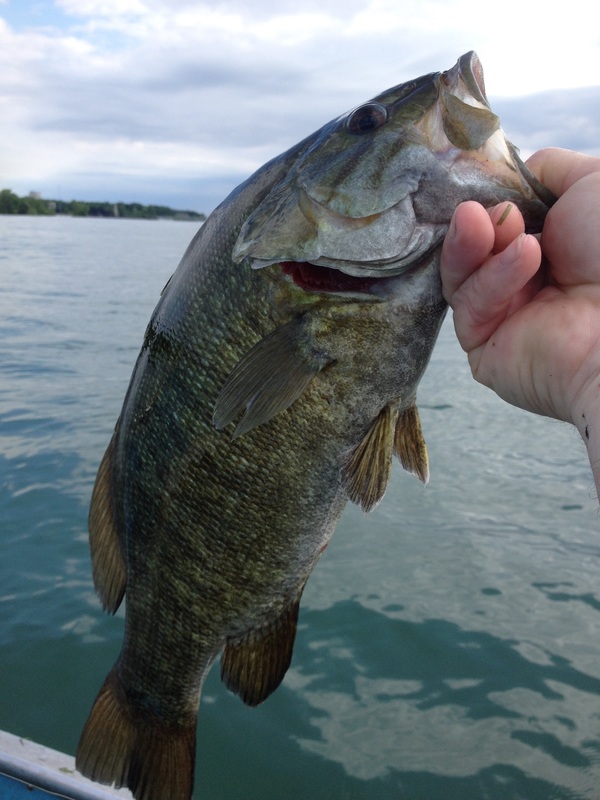 Since I don’t have to worry about getting up the next morning that opens up another opportunity, fishing farther north……the St. Clair River. The St. Clair River poses some new challenges, they aren’t too difficult but they have to be taken into consideration. The first is the drive. Depending on where I go it can be 1 ½ to 2 ½ hours. That may not seem like much but when it’s past midnight and I am driving home the extra time starts to be a grind. Another thing to consider is that the St. Clair is deeper and the current is faster than the Trenton Channel. Water depths average over 30 feet and with the current I have to use a 2 pound weight. Just think about bouncing that weight along the bottom for a few hours. It can make for a long night, especially if I’m not catching anything. There is a trade off though, the White Bass are non-existent. Now that I have typed this I’m sure they will show up but I have yet to catch one up there. I can use Nite Stalker’s (9, sorry) here as well but with no threat of White Bass I usually run my Rapala’s. Another good point about fishing up this way is that the size limit is only 13 inches and the daily possession limit is 6. Kind of makes that extra drive a little more worthwhile. Now that the DNR have changed the possession limit to 3 days I am planning a weekend trip up to Algonac. Stay at the Algonac State Park, fish Friday and Saturday night, sleep in, and have a fish fry Saturday before I head out. The last tactic to avoid catching them is to just not even fish for them to begin with. Between Mother’s Day and Father’s Day I tend to break out the fly rod. Bluegill and Trout are always a lot of fun on a 4 or 5 weight rod. With the brutal winter we had I spent a lot of time filling up the fly box both with traditional trout flies and foam patterns. I should be all set. I’ll probably go visit a local pond this Memorial Day weekend. I could go for a fresh bluegill dinner. So there it is my White Bass avoidance tactics or my Year in a Life strategy for May. Of course this same strategy will carry over into June and maybe even July if they don’t leave. 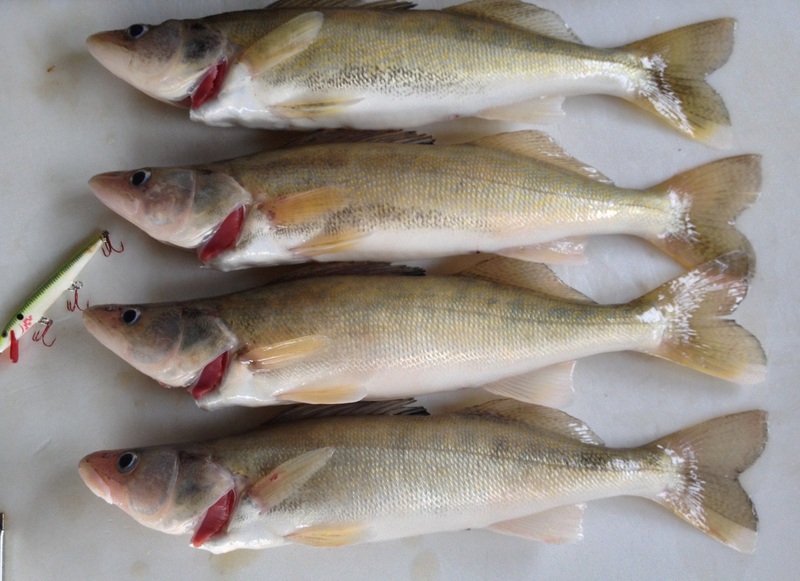 Hey Walleye…..Did you miss me? After being out of town all last week I wanted to get out and see if I could get back into walleye mode. Since I have a tournament coming up this Friday I needed some answers to a couple of questions. The first one was water clarity and the other was whether or not those other things had showed up yet. Last week I read a report about how a group of guys caught over 150 of them. I was hoping it was another false report and a bold faced lie. Since I didn’t know what the water would be like after a week of windy days and some rain I hit the water shortly after 7:00pm. Apparently the wind and rain had no affect on the water, it was still to clear for daytime wire pulling. While I was heading downstream I saw my friend Richard so I pulled up along side of him to see how he was doing. He had just landed a nice 24 inch walleye and he also told me caught one of those other things. I wasn’t too happy to hear that but maybe it was just a fluke catch like the ones I caught a few weeks back. We chatted for a few more minutes and then I headed further downstream to get set up. I started off with the #11 Bleeding Chartreuse Rapala that has been producing so well for me lately, a #9 Clown and a custom painted #7 Downriver Steel. Now all I needed was for the sun to set and this NE wind to die down. Forecast said it would but it never did, if anything it picked up after dark with gusts strong enough to spin the boat around whenever I wasn’t paying attention. At one point the wind was so constant that between it and the current I was at a stand still in the water. Boat control was a chore all night along. 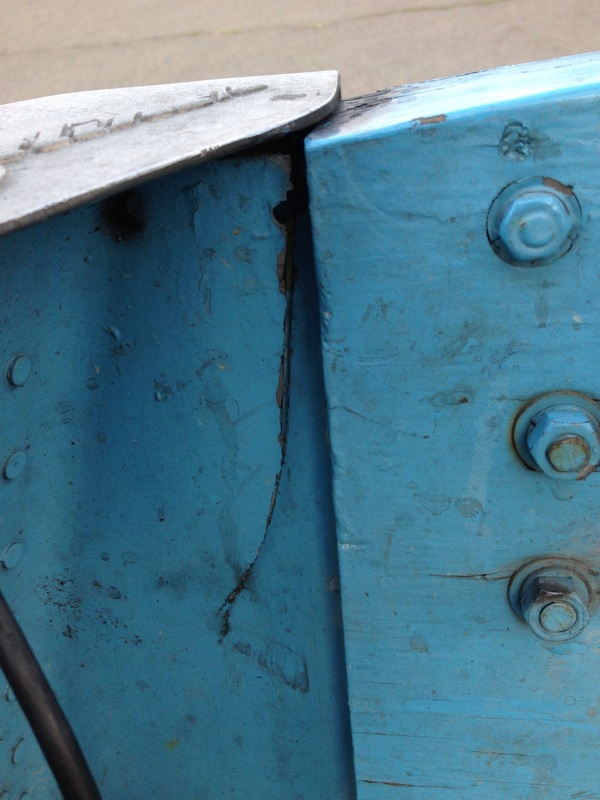 I was constantly increasing and decreasing my speed and fighting to keep the bow pointed upstream and not sideways. Fishing was slow at first with only a smallmouth and a headshake for my efforts. 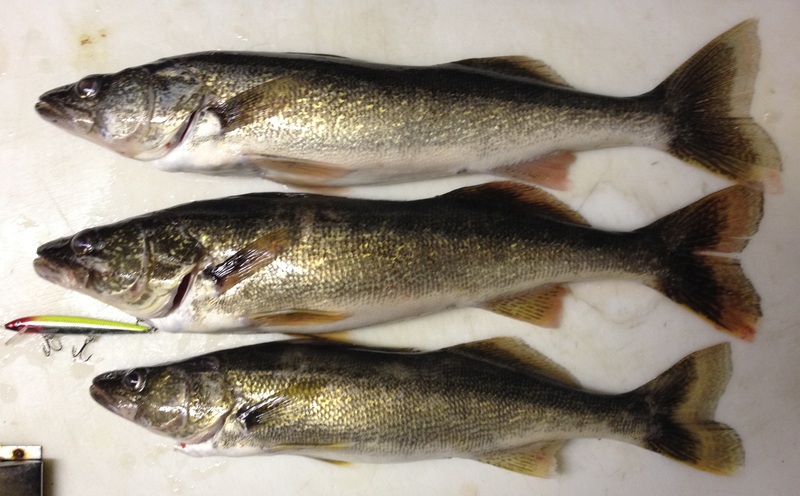 Just after 9:00 pm I had my first walleye of the night and I would pick up 3 more before 10:00pm. The wind was really starting to get on my nerves and after I had landed my third fish I told my self I was calling it quits with 4. Which I did. Before I packed it in I called Richard to see how he was doing, he had 3 in the boat and one of them was a nice 28 inch fish. He also told me he caught another one of those things. As for me I didn’t catch a single one. All in all it wasn’t a bad night, could have done without the NE wind but I have dealt with worse. Surface temp was 49.5 degrees when I started and by the time I had left it had dropped almost a degree. One of these days I will tie a thermometer on to my weight so I can get an idea of what the temp is at the bottom. My 4 fish were all eaters in the 17 to 20 inch range. Great for the freezer but lousy for a tournament. Hope I can find some bigger fish Friday night. My Dad was down for a few days so we decided to make a quick trip and see if we couldn’t catch a few walleye. Well that’s just what we did, catch a few walleye, 4 to be exact. Weeds were a nightmare once again. Once it got dark it became nearly impossible to get clean lures down to the bottom. For awhile every time I tried to set lines one of them would get fouled with weeds. On two different occasions all of our lines got tangled because of the huge batches of weeds we would snag. We did manage to each catch 2 but those fish were a lot of work. Mine came on a #9 Blue Holographic Rapala and my dad caught both of his on a blue and silver Smithwick Rattlin’ Rogue. One of them tangled up all our lines as he was bringing it in. The front hooks on the lure were in the jaw but the back hook caught the fish near the pectoral fins. This caused the fish to spin like a windmill as he was bringing it in. As the fish was spinning it caught all 5 lines. What a mess. After two hours of lures spending more time out of the water than in I called it quits. Other than the weeds the conditions were favorable. Water was clear with a surface temp of 69 degrees. There was a 5 mph Southerly breeze, clouds were overcast and no bugs. One of these days I am going to get an evening where everything is perfect. On a side note I received a phone call from one of the teachers at my kid’s school. He was wondering if I knew of any local fishermen who would donate walleye to families in need who have students attending the school. I told him I could donate and that I might be able to arrange a little mini tournament and have the fish cleaned and donated. I told him I would just need help cleaning and storing the fish until he can distribute it. Hopefully this can happen.